With love, from japan: Wasabi by Morimoto, Taj Mahal Palace, Mumbai. Wasabi by Morimoto, India’s first authentic Japanese fine dining restaurant, at Mumbai’s iconic Taj Mahal Palace, is extravagance personified. As we walk in for dinner on a weekday, a spectacular view of the moonlit Arabian sea adds sparkle to its quiet and dimly lit interiors. Despite being reasonably experimental with food, we must admit that the thought of Japanese cuisine did seem a bit daunting. But, the food is sensational, to say the least. 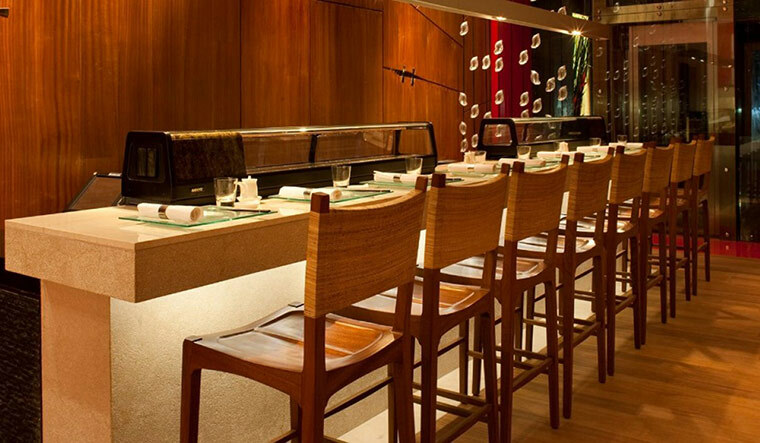 The extremely knowledgeable and courteous staff, always ready to strike up a conversation, suggest some of the signature dishes—shirokuro garlic sushi roll and mushroom truffle kamameshi rice. Siddharth Mittal, assistant manager of the Mumbai outpost, has an interesting insight into their sushi roll, made of garlic shoots with a garnish of truffle caviar and tiny bits of black garlic. “The black garlic sprinkled here is nothing but white garlic aged for two and a half years. A kilo of black garlic costs nothing less than Rs 70,000,” he says. The kamameshi rice, which has a generous serving of mushrooms, seems undercooked. “The rice is undercooked, at 95 per cent, to keep the flavour of the accompanying truffle from being killed by the otherwise mushy rice,” explains Mittal. Most of the items on the menu are designed by chef Masaharu Morimoto, known as Iron Chef. He is credited with bringing Japanese cuisine to India. The portions are quite filling, and most of the dishes are mind-blowing. The chicken tsukune is based on the robatayaki style of cooking, introduced three months ago at the restaurant. Similar to a barbecue, robatayaki involves cooking food at varying speeds over hot charcoal. It is every bit as crunchy as the chef promises. The dessert, kuro goma mille feuille (a fresh caramel Hokkaido chocolate ice cream), is a treat for the eyes as well. As the bill arrives (a five-figure sum), Mittal smiles and says, “Think that you are paying for the food you actually had sitting in Japan itself. Because with a seven-day cycle, we make sure to bring to you the finest and freshest Japanese food that can be made available, and 70 per cent of it is our incurred cost.” On a parting note, the staff, in a trademark Taj hospitality gesture, volunteers to click pictures for us and gifts us half-a-kilo cake. Sweet, no?